The video lectures were of great quality. The site was easy to navigate and materials easy to access. I like that videos and PowerPoints are downloadable. The work load was manageable, even though I ended up spending more like 4 – 6 hours instead of the 2 -4 hours stated in the course description. Assessments are two-fold: weekly quizzes and peer-assessed assignments. The weekly quizzes are factual recall and required me to look through my notes from video lectures to answer the questions. The assignments were more applicable: track nutrition and food eaten over a 24 hour period, create a daily meal plan for some one with diabetes, and make a dish that is significant in a culture – analyze its health benefits. It was definitely a different way to learn. However, it did remind me a bit of the large courses I took in college. Instruction was information-heavy and teacher-lead. It was hard to ask questions to the professor directly – you either have to attend office hours or see a TA. In the Coursera case, although the forum offers a way to bridge a gap between instructor and students, I found it very difficult to navigate through the plethora of forum posts. I would search for a topic that I had a question on, then peruse the comments in the thread. I did not feel comfortable or had the time to post regularly to the discussion forum. Overall, I enjoyed the experience. I had been exposed to the content before through my undergraduate and graduate work. It was nice to hear recent research done in the field. Also, it motivates me to continue to be mindful about my eating habits and to make healthy choices. In your opinion, what are the three most significant ways in which a tablet device may be useful for learning? Support your answers. Tablets, specifically, iPads have transformed the learning in my classroom. As I have mentioned in an earlier blog post, the Anatomy apps we use allow for a richness of images never before achieved in the class. The iPads and apps allow students to work on their own pace to discover the anatomical structures we’re focusing on for the day. Students can manipulate the images as they need. This ability allows for individualized learning that enables students to learn on their own at their own pace. Additionally, students are more engaged and motivated to learn with their shiny new devices. The iPads have been working out well in my class from my experience. However, I foresee that students can be more productive if we were on a 1:1 iPad program. This summer, I’m going to be part of a team of teachers to help pilot an iPad classroom in the summer school Biology program at my school. Although I have taught summer biology for the past three summers, I’m choosing to take a step back from being the classroom teacher this year to help support the integration of iPads into the curriculum. The students will be assigned an iPad for the duration of the course. Additionally, we plan to have a laptop cart along with several desktops in the classroom. We are just beginning to discuss the potential of individualized learning and other benefits of having an iPad classroom. In a nutshell, we already know that iPads can be used for content consumption. There are some amazing apps for Evolution and Cells that we will have students use. The next steps are ways to have students curate and create their own content using the iPads. Maybe they can create their own iMovie presenting as aspect of the Hawaiian ecosystem. 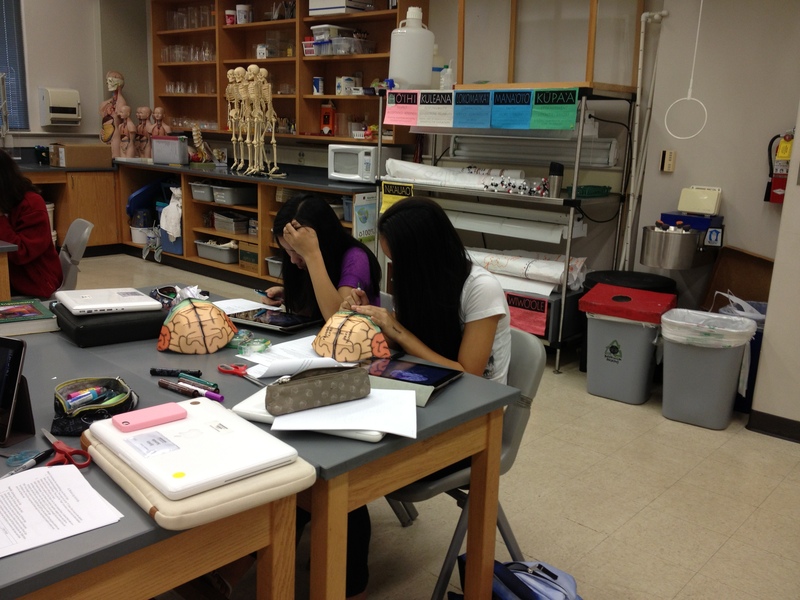 Or they can create an iBook chronicling their 6-week journey through the summer biology course. We’re hoping that from our experience this summer, we will have additional ideas around the successes and challenges of the iPad classroom. What to do with Big Data? On the topic of Big Data, I enjoyed reading Duhigg’s NY Times article, “How Companies Learn Your Secrets” (Feb 16, 2012). It was interesting to hear how Target uses shopping information to predict whether a woman is pregnant. I believe I must have been one of the statistics as I was pregnant with both my children around the time Andrew Pole developed his predictive model. I must admit, the ads worked for me. I have always preferred Target over other big box stores. I like that I can get everything I need in one place. Especially when I had my kids with me on shopping trips, it’s much easier to make one stop than 3 or 4 multiple stops. Personally, I didn’t mind getting those coupons and ads in the mail. I needed those items anyway, now I can get them for cheaper! As a teacher, I have been gathering data on my students’ test scores to help me determine whether it was an appropriate assessment and whether students are meeting the objectives for the course. Before using Haiku LMS, I used to type students’ test scores into an Excel spreadsheet or an online grading system to analyze the means. If the mean was low for a particular test, I usually go back to the test and look at the questions to see if it could be better phrased, etc. If a particularly low score on a test is a red-flag that I should reach out to the student and offer additional assistance. In the past 3 semesters, I have been using Haiku LMS for assessments. Students log into the course website using Safe Exam Browser to take the test/quiz. For most of my students, this is the first time they’ve ever taken their test or quiz online. One of the features I love is the ability to see how well students do on each question. 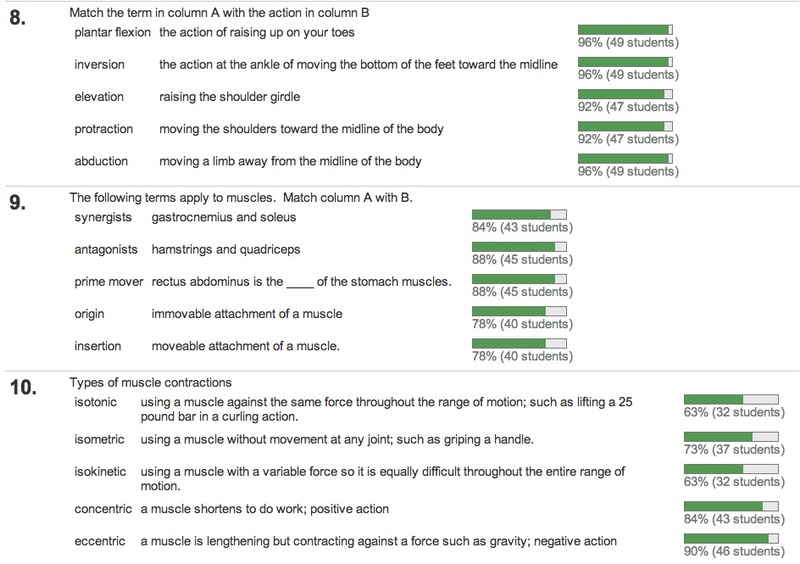 For example, on the recent Muscular system test, students did very well on the action terms since we did a huge Kinesiology project on analyzing movement and action. However, students seem to struggle a bit with the definitions for “origin”, “insertion”, and “isotonic”. This type of analytics allow me to note where students need further help with the material. I can identify trouble spots and revise my lessons for future classes. My students don’t have access to this particular information although they are able to view their test and see exactly what they got wrong. And they can do this in the comfort of their own home. No longer do I have students hounding me down at the end of class to find out what they got wrong on a particular question and why. Students can also view their grades as I update them so they always know where they stand in the class. I find that these features of Haiku LMS have removed the awkward grade disputes I used to have with students. I can focus more on planning more effective lessons to engage and motivate my students’ learning. Haiku LMS also offers a way to track how often students are logging in to access information. However, I don’t access this data very often partly because I do see my students in a face-to-face setting every other day. Through my interactions with students in class, I can usually tell which students I need to spend more time with. Big data is not going away. It’ll be interesting to see how other educators leverage the information gathered and how we use it to improve students’ learning. According to TechCrunch article on Thurs, Feb 28, 2013, Apple has sold more than 8 million iPads to educational institutions. That’s a startling number. I know that many schools on Oahu either already have a 1:1 iPad program or are on the verge of implementing the program. Those not on a 1:1 iPad program, such as the school I teach at, have access to iPad carts. In my own classroom, we use iPads about 25% of the time. There are great Anatomy apps that allow my students to visualize the body system we are covering. 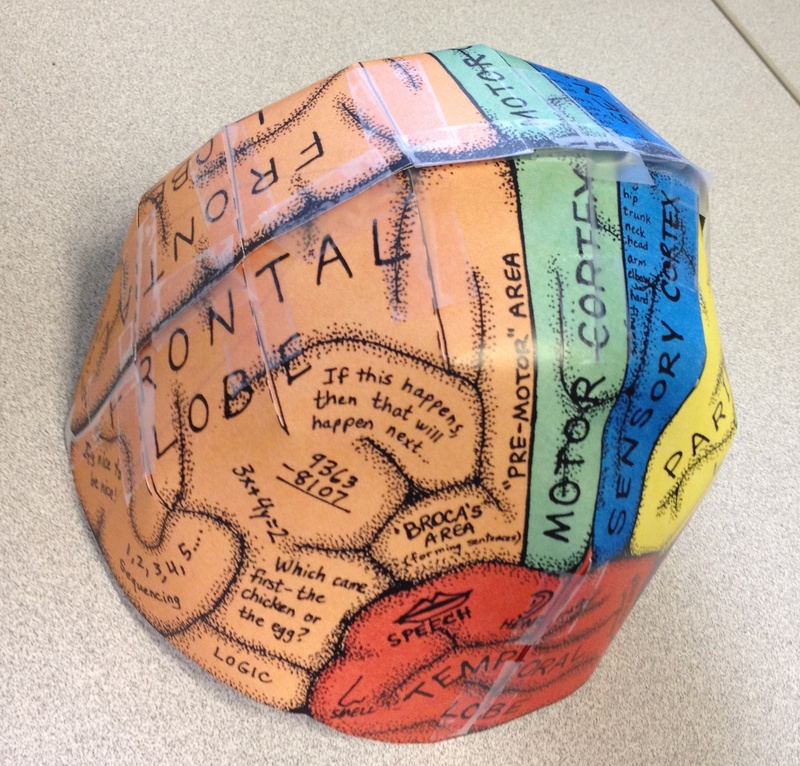 Just today, for introduction to the nervous system, I am having my students put together a Brain Cap, then using the 3D Brain App (free), students identify location and function of key structures in the brain such as the 4 lobes of the brain. I find that my students are more engaged and motivated with the content through using iPads than using the textbook and course management system alone. Although we are using iPads in the classroom, we are not truly maximizing the capacity of mobile learning. In true mobile learning, content and learning should be accessible from any where at anytime. At this point, my students can’t check out the iPads to take home. If they need the iPads beyond our class meeting time, they have to make an appointment to meet with me. Some students with iPhone or iTouch end up downloading the apps we use if they are free or relatively inexpensive. In order for my classroom to realize mobile learning, we would have to move to a 1:1 iPad classroom. Among the promise of mobile learning are more productivity and more engaged students. However, I find that there are still limits to iPads – especially when it comes to collaboration. I love the ease of collaborating in real-time on Google Docs. There isn’t an easy way to replicate this process on the iPads (yet). Thus, the best case scenario would be to have a 1:1 iPad program with access to a class set of laptops. However, in a year’s time, who knows where the technology will be and what new promises it will bring.